Option of KMH or MPH. 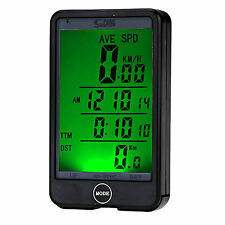 This is this new wireless bike speedo with over 20 functions an auto backlight and a large display to provide you with accurate readouts new touch button/screen function to make this very easy to use. Set of 5 High Density Closed Cell Plastazote Foam Blocks for Fly Tying. This foam has been specifically selected to ensure the best balance between robustness and buoyancy. Set of six stainless steel foam cutters, perfect for the preparation of foam for fly tying. Utile per lavori usuranti o continuativi (uso pc, sartoria, etc.). - Prevenzione dolori. A gel covers the inner surface of the tape that is self adhesive and perfect to wrap. An envelope icon next to the order will show that it has been dispatched and if you hover over it with your mouse you will see the date of dispatch. This adapter gives your 12 Gauge single or double shot break open shotgun the ability to fire 357 Magnum and 38 Special ammunition. This adapter is precision machined from high quality stainless steel to the OD specifications of a 2 3/4 12GA shell. Velobitz, PTFE Gear Cable Guide Tube. PTFE tubing has been used on top end racing bikes since the 60s. The tubing provides smoother gear shifting and paint protection where cables run through the. Protect Paint, Smooth Shifting. • Our 100% Cotton Char Cloth is easily ignited from use with Flint and Steel Ferro Rod. • x10 circular char cloth pieces 81mm (D) - approx. Brush on / PINSEL. 1/4oz / 7 Gramm. Large 100cm x 200cm. Perfect for keeping your bicycle dry and protected from rain, snow, etc. Waterproof Bicycle Protection Cover. Easily shaped to fit over handle bars and wheels. Tile Tools. Fitness & Exercise. Jetzt mit geringerem Verschleiss (verlängerter Lebensdauer) und ganzjährig optimaleren Einsatzbedingungen bei nahezu jeder Wetterlage. Magura MT5. Allows for easy transfer of sealant from one tire to another. Shin Guards. Now with rubber seal for smoother operation. Includes schrader valve core remover. Dual threaded plastic adapter fits both presta and schrader valves.